Google Japan started to offer a recipe search feature last year. Now this feature is available in the US and for everyone who uses Google without country redirects. "Recipe View lets you narrow your search results to show only recipes, and helps you choose the right recipe amongst the search results by showing clearly marked ratings, ingredients and pictures. To get to Recipe View, click on the Recipes link in the left-hand panel when searching for a recipe. You can search for specific recipes like [chocolate chip cookies], or more open-ended topics—like [strawberry] to find recipes that feature strawberries, or even a holiday or event, like [cinco de mayo]," explains Google. 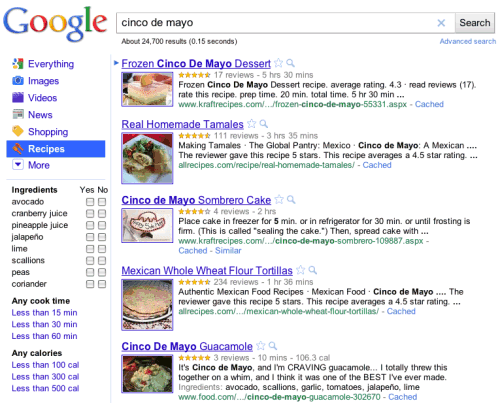 Google finds recipes by detecting the pages that use markup like microdata, RDFa, and microformats for recipes. You've probably noticed that Google shows rich snippets for some recipe pages and sometimes includes thumbnails, total cooking time, the number of calories and user ratings. The same structured data can now be used for filtering search results. For example, you can select certain ingredients, add restrictions for cooking time and the number of calories. Recipe Search is one of the most obscure specialized search engines offered by Google and it's quite surprising to see it in the vertical navigation menu next to Book Search, Blog Search or Image Search. Google could create similar search engines for event search, people search and reviews search. Google's landing page offers more information about this feature and suggests to "select Recipes in the left-hand panel on the search results page". Unfortunately, the option is not yet available for everyone.